John McClane is having a bad day. Terrorists have taken over the building and have hostages. John McClane needs to thwart the terrorists plans and rescue the hostages before it’s too late. 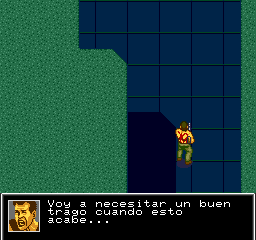 This is an overhead run and gun type shooter a la Commando. 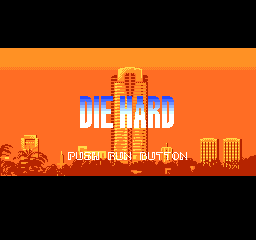 You play footwear challenged cop John McClane as you run through various levels picking up guns and ammo and blasting through an army of fairly annoying thugs. 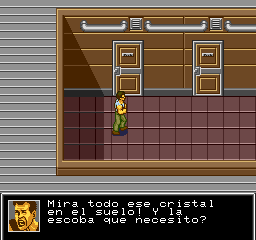 This game is VERY loosely based on the Die Hard movie. 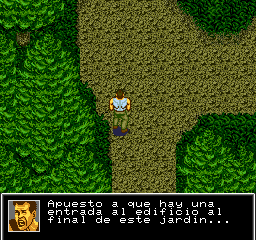 As a matter of fact, the stages are often outdoors, and you traverse jungles and swamps that are more reminiscent of Metal Gear than anything else. In short, this is nothing like the horrid NES port, although that one does skew quite a bit closer as far as the story is concerned. Aside from the different weapon pick ups, you can also grab a bulletproof vest to soak up a few more shots. This is in addition to a fairly generous life bar so one hit deaths are not a concern. It’s quite fun if a bit repetitive, but well worth a playthrough. 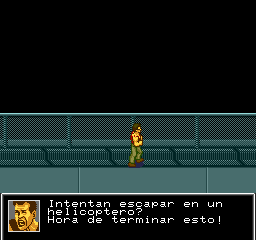 Spanish translation for “Die Hard”, for the turbografx 16/pc engine. Based on the English translation by Spinner 8 and friends. v1.1: Added patch for japan rom, the previous was for the english translated.